A writer I interviewed for the Listener last year said that if you could swab the books at your local library to find the ones written under the influence of drugs, “spines would turn red all over the shop”. This may be a slight exaggeration, but it wouldn’t be a stretch to make a long list of writers who use(d) drugs to fuel their writing. American author Craig Clevenger has said that he’s not a big drug taker. “But,” he adds, “I’ll make no apologies for the ones I’ve done. I’ll indulge like anyone else.” Although Clevenger only fesses up to recreational drug use, the protagonists in his two novels thus far recklessly imbibe. His first book, The Contortionist’s Handbook, about a forger addicted to painkillers, is a beautifully written thing with deftly structured plotlines. 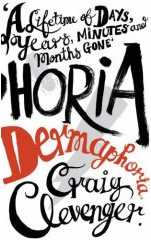 Dermaphoria, which reads more like a long short story, is about a clandestine chemist who fries his brain when he swallows a handful of pills – “fireflies and black widows”. The plot unravels in fragments. There’s Detective Anslinger who questions Eric; there’s the lawyer on his case, but Eric’s confused. (“My case. I have a case. I’ve run a red light or I’ve been caught with a severed head in a paper bag. I’m scared to ask.”) We learn that Eric was a chemist for a drug ring. The Mobsters want him to reconstitute his methamphetamine/LSD hybrid, but Eric’s lost the formula. We meet his boss Manhattan White and his son Toe Tag, who “can gut, cut and pack a grown man into a garbage bag in under 40 minutes”.